Benign cystic pneumatosis. 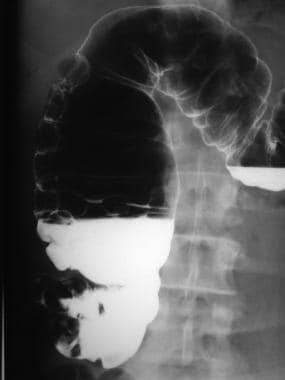 Radiograph from a barium enema study demonstrates rounded, lucent filling defects in the right side of the colon. 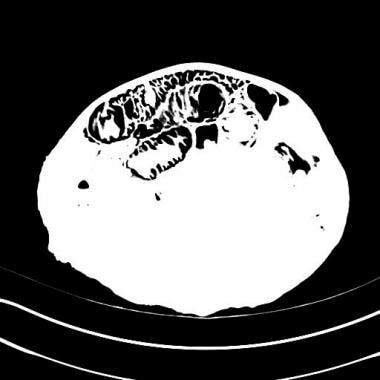 Computed tomography (CT) scan in a soft-tissue window in a patient with intestinal ischemia demonstrates circumferential small bowel pneumatosis. Three-dimensional volume-rendered computed tomography (CT) scan in a patient with ischemic bowel demonstrates circumferential small bowel pneumatosis intestinalis. Microvesicular gas collections, defined as 10-100 mm cysts or bubbles within the lamina propria, are predominantly associated with primary (benign) pneumatosis intestinalis, whereas linear or curvilinear gas collections seen parallel to the bowel wall are found in secondary pneumatosis. Therefore, linear gas collections are usually an ominous sign. The patterns of the radiolucencies are seen as linear, curvilinear, small bubbles, or collections of cysts. Cystic collections of gas localized to the wall of the colon are suggestive of primary pneumatosis intestinalis. 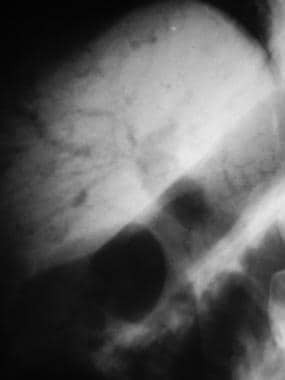 Pneumatosis intestinalis may be complicated by pneumoperitoneum, which can be detected as free air on a simple upright or cross-table lateral view of the abdomen. 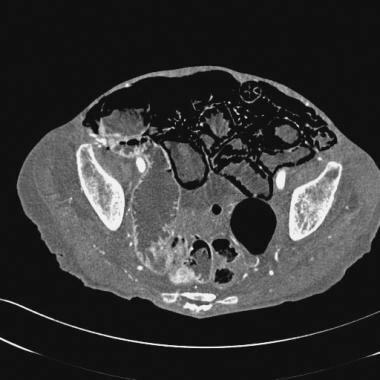 Abdominal radiographic findings are detected in approximately two thirds of patients with pneumatosis. Radiographs are sufficient for diagnosis of pneumatosis, although additional studies, such as CT scans, ultrasonograms, or water-soluble enema studies, may be considered to delineate pneumatosis or the site of perforation. The concomitant finding of portal venous gas does not always suggest bowel ischemia. Other etiologies must be clinically correlated with the patient's history. The presence of gas in the mesenteric and portal circulation is an ominous radiographic finding in bowel ischemia. 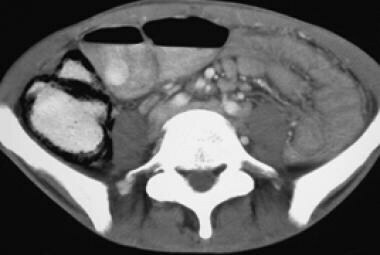 Rarely, emphysematous ureteritis may simulate pneumatosis of the descending or sigmoid colon on plain radiographs. Angiography can provide insight into the nature of vascular compromise. 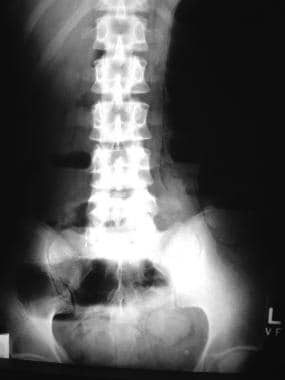 Radiograph in a patient with ischemic bowel demonstrates linear pneumatosis intestinalis. Radiograph in a patient with intestinal ischemia demonstrates portal venous gas. Necrotizing enterocolitis (NEC) in an infant. Pneumatosis is usually secondary to NEC in newborns. Computed tomography (CT) scan in a lung window in a patient with ischemic bowel more easily demonstrates circumferential pneumatosis intestinalis than do scans obtained with other settings. Pneumatosis of the right colon in a patient with human immunodeficiency virus (HIV). Benign small bowel pneumatosis in a patient with multiple myeloma secondary to amyloidosis. Misregistration artifact occurs only on the nondependent wall and usually involves the superficial wall layers, in contrast to pneumatosis intestinalis, which is typically circumferential and often has a submucosal or subserosal location. 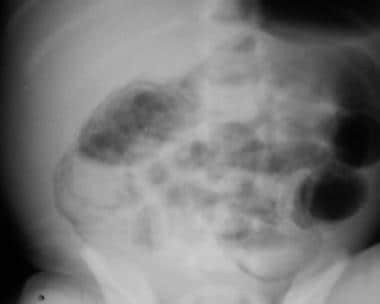 In addition to the familiar artifacts of dirty shadowing and small reverberation artifacts, a bubble of intraluminal gas may falsely lie within the gut wall, producing an artifact called pseudopneumatosis. It is more likely seen with thickening of the gut wall. Sugihara Y, Okada H. Pneumatosis Cystoides Intestinalis. N Engl J Med. 2017 Dec 7. 377 (23):2266. [Medline]. [Full Text]. Kang G. Benign pneumatosis intestinalis: Dilemma for primary care clinicians. Can Fam Physician. 2017 Oct. 63 (10):766-768. [Medline]. [Full Text]. Lee KS, Hwang S, Rúa SM, Janjigian YY, Gollub MJ. 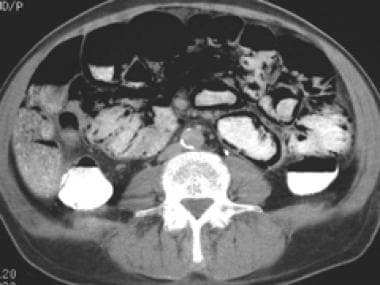 Distinguishing benign and life-threatening pneumatosis intestinalis in patients with cancer by CT imaging features. AJR Am J Roentgenol. 2013 May. 200(5):1042-7. [Medline]. Ling FY, Zafar AM, Angel LF, Mumbower AL. Benign pneumatosis intestinalis after bilateral lung transplantation. BMJ Case Rep. 2015 Oct 15. 2015:[Medline]. 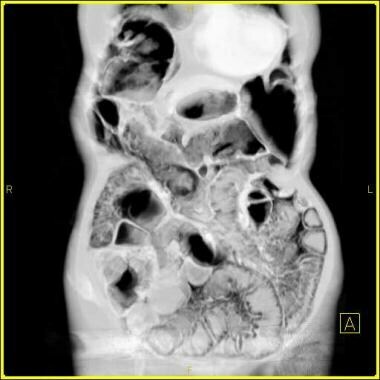 Blair HA, Baker R, Albazaz R. Pneumatosis intestinalis an increasingly common radiological finding, benign or life-threatening? A case series. BMJ Case Rep. 2015 Feb 18. 2015:[Medline]. Theisen J, Juhnke P, Stein HJ, et al. Pneumatosis cystoides intestinalis coli. Surg Endosc. 2003 Jan. 17(1):157-8. [Medline]. Muchantef K, Epelman M, Darge K, Kirpalani H, Laje P, Anupindi SA. Sonographic and radiographic imaging features of the neonate with necrotizing enterocolitis: correlating findings with outcomes. Pediatr Radiol. 2013 Nov. 43 (11):1444-52. [Medline]. Ribaldone DG, Bruno M, Gaia S, Saracco GM, De Angelis C. Endoscopic ultrasound to diagnose pneumatosis cystoides intestinalis (with video). Endosc Ultrasound. 2017 Nov-Dec. 6 (6):416-417. [Medline]. [Full Text]. Takase A, Akuzawa N, Naitoh H, Aoki J. Pneumatosis intestinalis with a benign clinical course: a report of two cases. BMC Res Notes. 2017 Jul 25. 10 (1):319. [Medline]. [Full Text]. Rottenstreich A, Agmon Y, Elazary R. A Rare Case of Benign Pneumatosis Intestinalis with Portal Venous Gas and Pneumoperitoneum Induced by Acarbose. Intern Med. 2015. 54 (14):1733-6. [Medline]. [Full Text]. Suzuki E, Kanno T, Hazama M, Kobayashi H, Watanabe H, Ohira H. Four Cases of Pneumatosis Cystoides Intestinalis Complicated by Connective Tissue Diseases. Intern Med. 2017. 56 (9):1101-1106. [Medline]. [Full Text]. Nonenhanced computed tomography (CT) scan in a patient with intestinal ischemia demonstrates portal venous gas.